It started with Fido offering a Boxing Day promo plan offering unlimited Canada-wide calling with 6GB of data for $60, for BYOD customers. 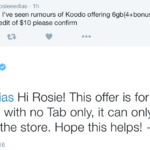 Then, Koodo Mobile responded yesterday offering a $65 plan with 6GB of data (4GB + 2GB bonus), plus $10/month in credits for 12 months. These plans are for new activations only. Now, Bell’s Virgin Mobile has responded, matching Koodo, offering a $65 per month unlimited Canada-wide calling BYOD plan with 6GB data (4GB + 2GB bonus), but also throwing in $10/month credits for 12 months, taking it down to $55/month. The plan also includes unlimited SMS/MMS to International destinations. If you add a second line, you can also get 10% off, which is the same for Fido. The plan is not listed on the website, but you need to visit a Virgin Mobile store or dealer. These promos are only available in-store, so you need to ask for them (you could try calling or doing online chat, if you’re lucky). It’s the $65 plan with 4GB, but with a 2GB data bonus added. It also comes with 1000 bonus International calling minutes right now. This plan is only available until the end of today, which is the expiry date for Fido’s Boxing Day promo plan. Let us know if you’re going to try and jump on this plan as a new activation (or as an existing user if you’re lucky).